The Minardi PS02 is a major development of the PS01 and includes a unique titanium-cased gearbox. Paired to the Asiatech V10 new front suspension geometry, the car was announced as the start a new period in the history of Minardi. The car was debuted by Alex Yoong at the historic circuit Enzo e Dino Ferrari, near the team's Faenza base, in eastern Italy. It was less than a month later that the team officially launched the car in Malaysia. In terms of results, the team had the best season in years as rookie Mark Webber was able to take 2 points in the opening race of the season (Melbourne, Australia). While no further points were gathered it was better than what the team had realised in the years before. 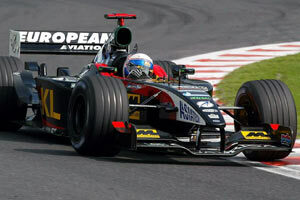 Webber proved to be a strong driver but his teammate Alex Yoong struggled with the car. He was mainly there to please the Kuala Lumpur sponsoring of the team. However, after Yoong failed to qualify 3 times in a row, the team replaced him for the Hungarian and Belgian GP by Anthony Davidson. His qualifying times were within 0.6s of teammate Mark Webber but he spun out of both events. The new car is significantly different from its predecessor, the PS01. The PS02 benefits from the extensive experience of the team's chief aerodynamicist, Loic Bigois, and his technical staff, plus considerable time spent in wind tunnels at Casumaro, Italy, and Southampton, England. Compared with the 2001 car, the KL Minardi Asiatech PS02 features a more raised nose section, reshaped and extended engine cover, and higher sidepods with different inlets. Beneath the curvaceous bodywork, there is an all-new "floor", optimised to work in conjunction with the latest slim-line version of Minardi's unique, titanium-cased gearbox. In terms of mechanical layout, the most notable alteration to the 2002 car is the use of pushrod rather than pullrod-operated front suspension. Also new is the Asiatech AT02 V10 engine. Aside from being more powerful, it is also lighter and more compact than the unit it replaces, making it easier for the team’s designers to accommodate all the necessary ancillaries around the engine. Additionally, it is more efficient in terms of cooling requirements. The team's technical director commented: "We are very satisfied with the way the new car has come together and the way this first shakedown test has gone. We are benefiting in particular from the fact that we have had ample 'lead-time' to work on the whole package. For example, we understood well what areas of last season's car we wanted to improve, we have known for some time what engine we are using, and we have been able to spend many useful hours in the wind tunnel developing the aerodynamic package for the PS02. As a result, we are far ahead of where we were at this time last year." Team Principal, Paul Stoddart said: "We're proud and pleased that the new car had a successful debut today. The initial technical feedback suggests we have made identifiable progress in a number of areas, in particular, the engine, courtesy of Asiatech's new AT02 V10, and aerodynamic performance, which is the result of an intensive wind-tunnel programme undertaken by the team over the last six months." "It's early days yet, but we believe there is a genuine opportunity for us to score World Championship points this season. We will continue testing through the month of February and look forward with great anticipation to Melbourne, where we will be able to gauge the progress we have made and see if it has put us ahead of some of our rivals on the grid." Alex Yoong said: "I will admit to feeling very excited before getting into the KL Minardi Asiatech PS02 this afternoon. The team has put a great deal of hard work into the new car, and it shows. Today was purely a shakedown, with serious testing beginning in Valencia next week, but even so, it was possible to feel the potential. I was particularly pleased with how comfortable I felt in the cockpit, and am now looking forward to some serious running in Spain."